This Hinkley Ainsley 2 light polished chrome bathroom wall light with opal glass shades is rated IP44 and features classic traditional style. Boasting a stepped circular wall mount, over-arching arm and horizontal bar supporting two spun shade fitters, with two downward facing retro style opal white glass shades finished with elegant chrome trim. Ainsley’s traditional silhouette charms with distinctive details like retro modern turned shade cups. Cased opal glass shades are accented with an elegant trim ring as a finishing touch. 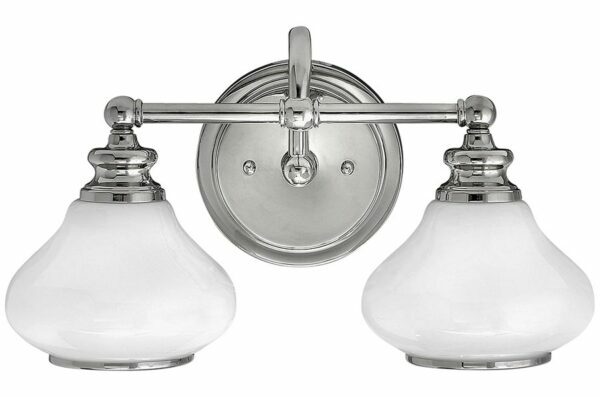 If you are searching for a quality wall light to complement your bathroom, the Ainsley is certainly one to consider. The sleek lines are suitable for a contemporary setting, whilst the retro style makes it suitable for traditional and period bathrooms too. This wall light has been specifically designed for use in bathrooms but can be used anywhere inside your home except wet rooms. Supplied with energy efficient LED lamps, rated IP44, fully splash proof and suitable for bathroom zones 1 and 2. There is a matching single and three-light wall light available in the Ainsley bathroom collection that can be viewed below. This bathroom light is supplied by Elstead Lighting and designed in the USA by Hinkley, founded in 1922 in Cleveland, Ohio. They have transformed from a small outdoor lantern company to a global brand intent on bringing you the best in style, quality and value designs like the Ainsley 2 light polished chrome bathroom wall light with opal glass shades featured here.